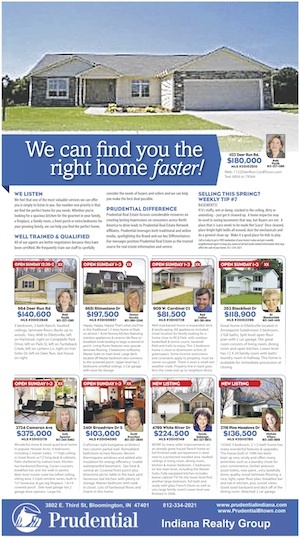 Getting a realtor on track with larger, more effective ads that work the very first time they run is possible, but you've got to change the way realtors think about using print and online newspapers and come through with a more effective ad. If you have realtors who have cut back on advertising, who claim that running in your newspaper does little else but keep their listers happy (and really, who hasn't run into this objection) or who think their money is better spent on the Web alone, then this post is for you. Within days of conducting our Response Oriented Selling course for his staff, Brian Doane, VP of Advertising of the Hoosier Times at Schurz Communications, took this and a few other realtors from small or non-existent ads to full-page, 16-time contracts using our Response Oriented Selling techniques. Brian had previously championed dramatic success with our ad sales approach while at another newspaper in Nampa, Idaho. He knew the advertisers cries of, "I've got to cut back due to the recession," "I have no money," and "you're too expensive," were merely signs that some of the business community had lost their faith in the medium. He knew if he used a better approach to creating effective ad strategies, and then presented a strategy based on that approach, that the doubters would spend what they needed to be successful and he could ultimately show them how well his publication works when used properly. After all, there were plenty of people buying homes, just less than before. So, he made a point of inviting key realtors--who he knew he could get running and running significantly more--to one of the prospective advertiser seminars we conduct as part of our larger course. 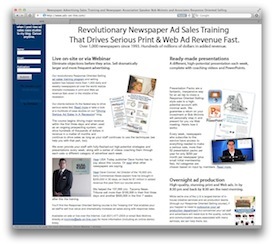 In these sessions, we show the print and online newspaper ad sales techniques in action while teaching the attendees effective strategies to get a dramatic response immediately and consistently afterward. The attendees bought into the new response principles, including the part about ad size and frequency, and Brian followed up with them, gathering more information from the prospects, applying the techniques to the information about the realtor's business and went out and closed a number of them shortly afterward. "They've never had an ad work this well before," said Brian. "They told me the phone was ringing off the hook. That's pretty impressive for real estate." The real estate category is an interesting one, since most of them are convinced the only way to use print is to fill their ad with listings. Of course, this helps them keep their listers happy (and attracts more of them,) but there are so many more reasons why people list with or buy from one realtor rather than another, and many of those reasons are not addressed in most real estate ads. The things most important to a prospective client--such as how hard they'll work for you, their experience, if they'll get top dollar for your home, how fast they'll sell your home, how good they are at listening and making things easy--while most realtors are adamant that these things matter to the customer, they're nowhere to be seen in a typical real estate ad. As Brian pointed out, "It's no secret there are fewer people buying real estate in this market, so we needed to show these prospective home buyers that this particular realtor was better at helping them find the right home for them, and that required some real copy. After all, our readers are readers, and especially with a high-ticket item like this, they'll spend the time reading a more sophisticated message. That's one of the key strengths of any publication like ours and we need to take advantage of that." Brian is continuing to refine and experiment with the ad as it keeps running through it's initial 16-time run, but we're optimistic they'll keep it up. "For us to thrive in this economy, our ad reps need to be able to deliver the whole package. They need to be able to prove the ad strategy will work just as well as the newspaper or the prospect just won't run or end up running smaller, less frequently, and end up reinforcing their misperception that newspapers don't work. And often this involves using Bob's techniques to fix their incorrect theories about what works and what doesn't so they're okay with committing to what they often see as a significant amount of money."